Milan sometimes gets overlooked in favor of Rome, Venice and Florence. But Milan is worthy of a closer look. While it is known the world over as a global capital of fashion, it is also a treasure trove of art, history and architecture. Please be aware the itinerary of this tour will be based around the time of your viewing tickets for The Last Supper as well as your interests. Your guide will discuss your preferences with you to ensure a wonderful day in Milan. 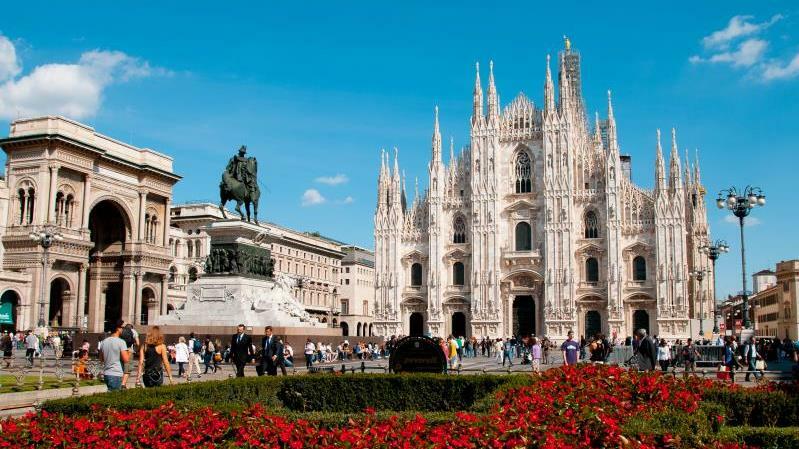 As your guide leads you through the picturesque streets and squares, you will suddenly find yourself at Milan's most iconic symbol, The Duomo Gothic Cathedral. This magnificent, massive structure, which took more than 6 centuries to build, is almost too much to take in. Gorgeous stained-glass windows, intricately carved altars, sculptures and statues, are all a testament to the exquisite craftsmanship of the artists and artisans who worked tirelessly to bring this cathedral to life. But we're not done with The Duomo. A 50-step climb to the roof provides the best vantage point in the city to view the Milan skyline, from the impressive icons to the tallest skyscrapers. No visit to Milan would be complete without a trip to the chic and trendy Vittorial Emanuele Gallery. This most exclusive shopping gallery in Milan underscores the city's reputation for high fashion and will have you feeling like a "fashionista" yourself. Your guide will be happy to recommend a delightful place enjoy lunch and get a true taste of Milanese cuisine. The afternoon brings you to what is sure to the highlight of your visit to Milan. 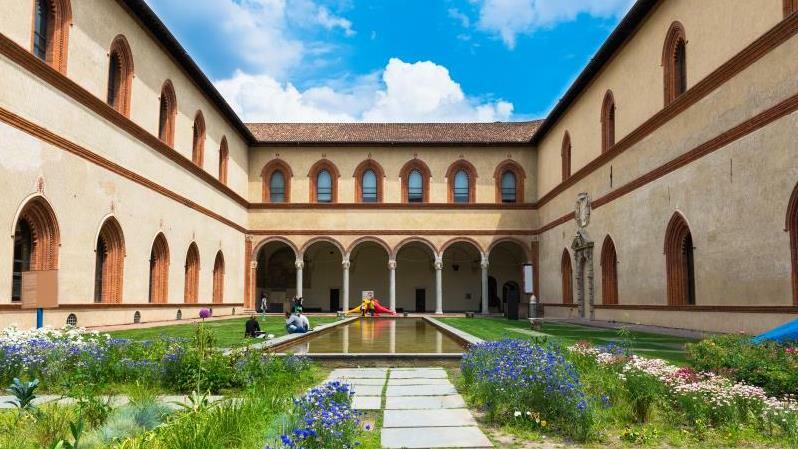 The UNESCO World Heritage Church of Santa Maria delle Grazie is home to Leonardo Da Vinci's masterpiece, the Last Supper. Skip the lines and gaze upon one of the most iconic paintings in the world. From here your guide will take you to a hidden gem, the 16th century Church of San Maurizio al Monastero Maggiore. Often referred to as the "Sistine Chapel of Milan", here you will find paintings of incomparable beauty by disciples of Leonardo da Vinci. Moving on to the Castello Sforzesco, your guide will reveal to you many stories about the Sforza Family and why Leonardo Da Vinvci lived there for many years. Leonardo is not the only famous Renaissance artist to leave his mark on Milan. This wonderful day ends with a visit to the museum dedicated to Michelangelo. See his moving Pieta Rondanini sculpture and find out the details behind this unfinished masterpiece. - This is a walking tour, please wear comfortable shoes. - Sunglasses and a hat are recommended. - If you are interested in being picked up at your hotel, please contact ShoreTrips for pricing. Please note that most of these sites will need to be visited by foot. - Your guide will accompany you for the entire tour, including your visit to The Last Supper. 09:00 AM (6.5 hours) If you need to adjust your time, please call ShoreTrips prior to placing your reservation. - This tour is not available on Mondays. - This tour is not available on Christmas Day, New Year's Day or May 1st. - Please note that on the first Sunday of each month many tourist sites in Italy have free admission. This can often result in long lines. If you are staying at a hotel, it may be beneficial to avoid booking a tour involving inside visits to major attractions on these days. If you have questions, contact ShoreTrips. - If you need to adjust your time, please call ShoreTrips prior to placing your reservation. - In addition to walking, this tour includes climbing approximately 50 steps to the roof of the Duomo. - Cost of all attractions are included in the price of the tour. - Food, drinks and lunch are not included in the price of the tour. - A dress code is in effect to enter places of worship and selected museums. NO SHORTS OR SLEEVELESS TOPS ALLOWED. KNEES AND SHOULDERS MUST BE COVERED FOR BOTH MEN AND WOMEN. You may be refused entry if you fail to comply with these dress requirements. - Due to increased security measures at many attractions, some lines might form on tours with "Skip the Line" access. - Strict security measures at many attractions prohibit knives, scissors, glass bottles, etc.